For our June 2014 issue, we presented our special double-sized anniversary issue: Women Destroy Science Fiction!, an all-science fiction extravaganza entirely written—and edited!—by women. 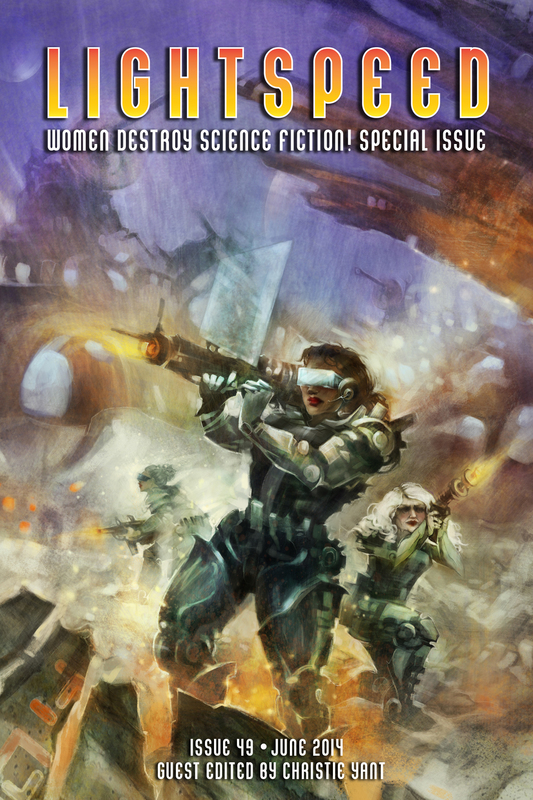 Guest-edited by long-time LIGHTSPEED assistant editor Christie Yant, our Women Destroy Science Fiction! Issue contains eleven all-new, original science fiction short stories, plus four short story reprints, a novella reprint, and for the first time ever, an array of fifteen flash fiction stories. In addition to all that goodness, we also have more than two dozen personal essays by women talking about their experiences reading and writing science fiction, plus seven in-depth nonfiction articles. Content available to read free on the web is linked below. All other content is exclusive to the complete edition, available as an ebook or trade paperback.